Graduate student in history, web developer for a university, author and artist for Planescape: Metamorphosis, avid gamer, D&D, World of Darkness, and Guild Wars fan. #21 will come later tonight! Don’t forget to check out my Djinnborn Blog to see other characters and designs! 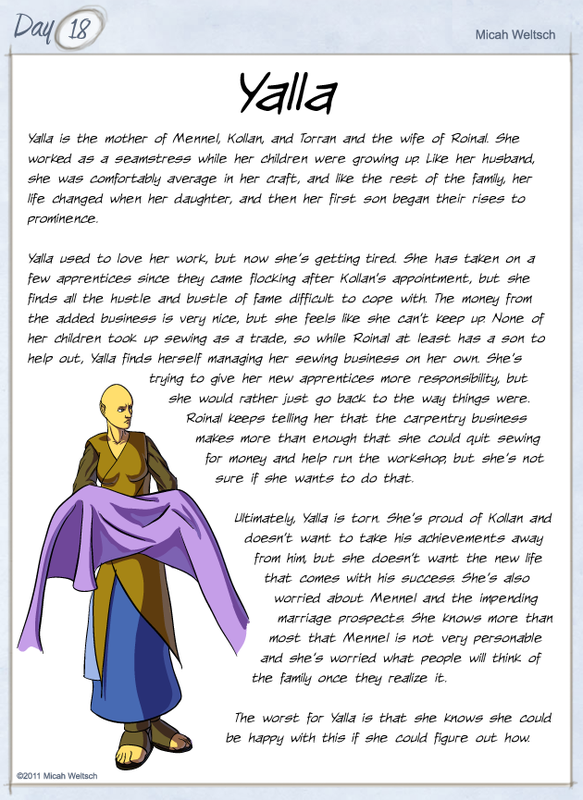 The last member of Kollan’s family is finally posted! Down below are links to the other members! Yalla and Roinal, her husband, are both in the same boat. They’re proud of their son, but they never anticipated how his success would change their lives and they have no idea how to cope. Roinal buries himself in his work to try and forget about it, but Yalla tries to distance herself from it. Both of them need to learn how to handle it sooner or later, or it’ll take its toll. Here’s the father of the little family that one of my main characters is a part of! His oldest kid, Mennel, and his youngest kid, Torran, were both featured on the 30 Characters Challenge! Check them out! Kollan’s got a few articles up over at my blog. He’s the main cast’s “smart guy” and will be doing “smart” things like engineering and knowledge! Roinal’s the first Ropoldi character I’ve drawn with his mouth open like this. I should note that if you look closely, you can see he has elongated canine teeth. The Ropoldi diet requires high protein. They live in arid plains and while many of the plants are fine for the vast numbers of herd and pack animals that dwell on the plains, they are not as easy for Ropoldi to eat or digest. The Ropoldi are highly carnivorous and they have longer and sharper teeth to facilitate this better. 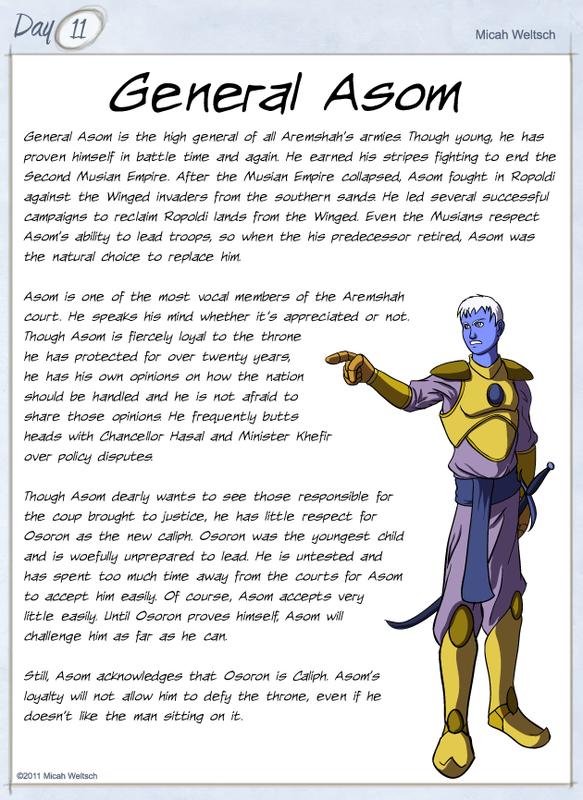 For more about some of the characters mentioned above, you can check out the following links! 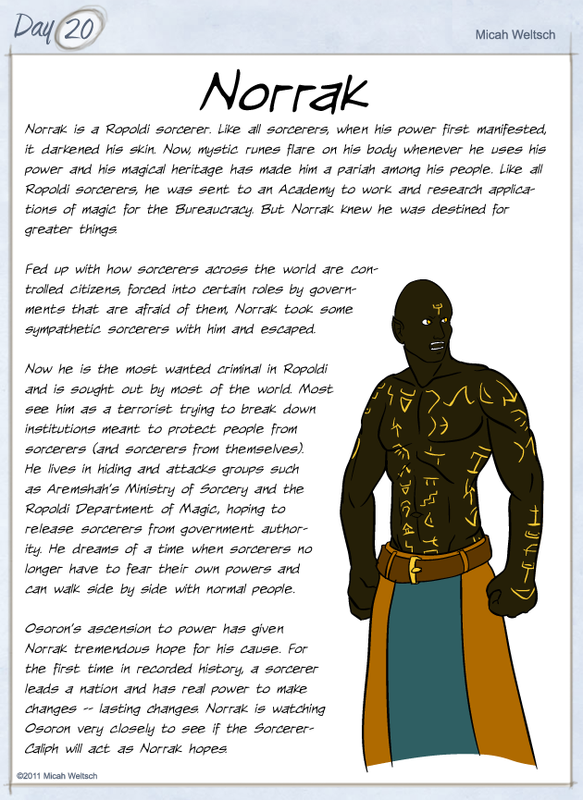 As always, you can also head over to my comic development blog to read up on the setting and the different characters! 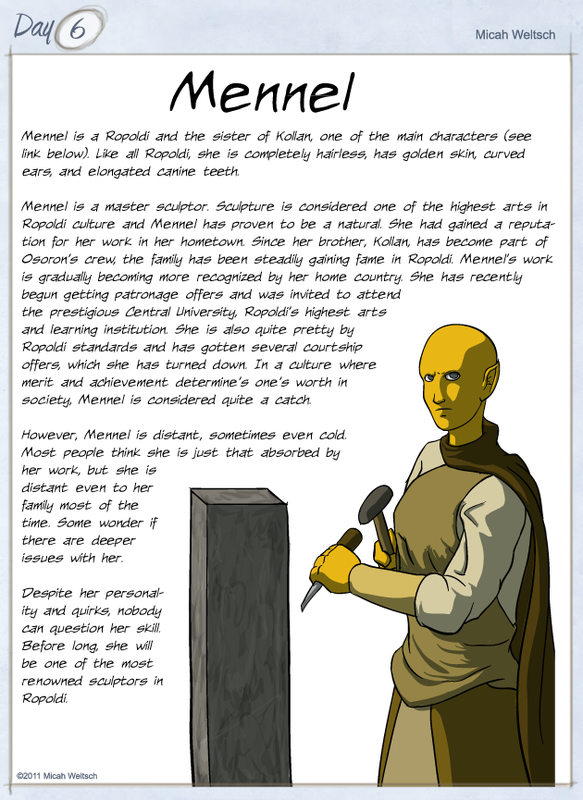 You can read about Torran’s sister Mennel on her 30 Characters entry. 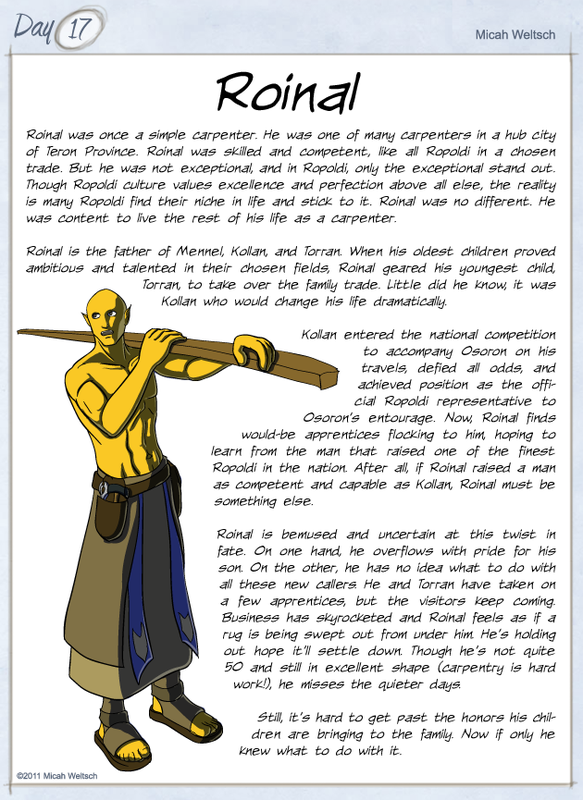 You can also read about Kollan at my blog! Catala’s aide and lieutenant is now up! As always, if you check out my blog, you can read more about the world this story takes place in. It’ll give you the info on characters like Osoron and others! Number 11! The general of Aremshah! I am not completely satisfied with his design but I like the colors. But I have him out of my head now, so I can refine the design later! 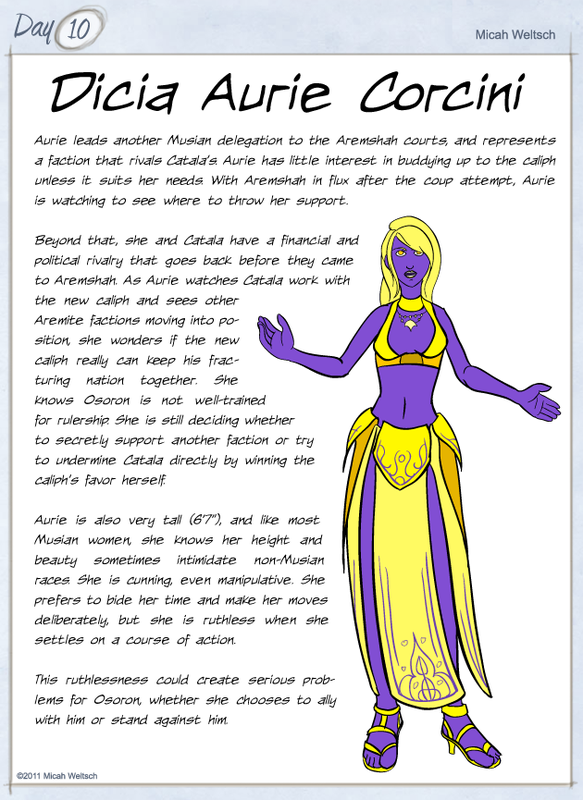 For more information about her rival, check out Catala’s entry! Once 30 Characters is over, I plan to draw up (literally) some extensive profiles for each of the five races in my comic. If you’re interested, subscribe to my blog! 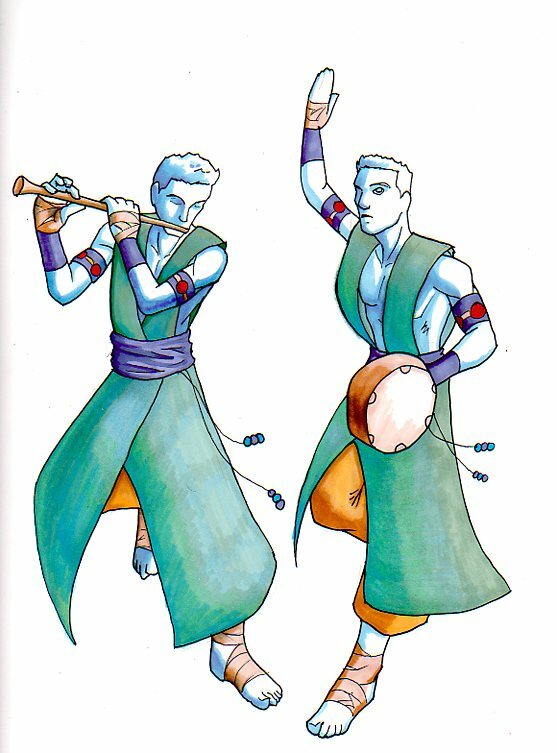 See more about Catala (one of Tirashi’s rivals) and Revrak (Tirashi’s apprentice) on their entries! You will want to take a look at my last entry, Chiasnos, to understand more about her former lover. Her son, Naskos, is a big guy you can read about on my deviantART! If you’re on Google+, I have a Page set up for Djinnborn! I’ll be posting other updates, links, images, and world information as I continue putting the comic together. Hope to see you there! You can read more about Naskos on my deviantART. 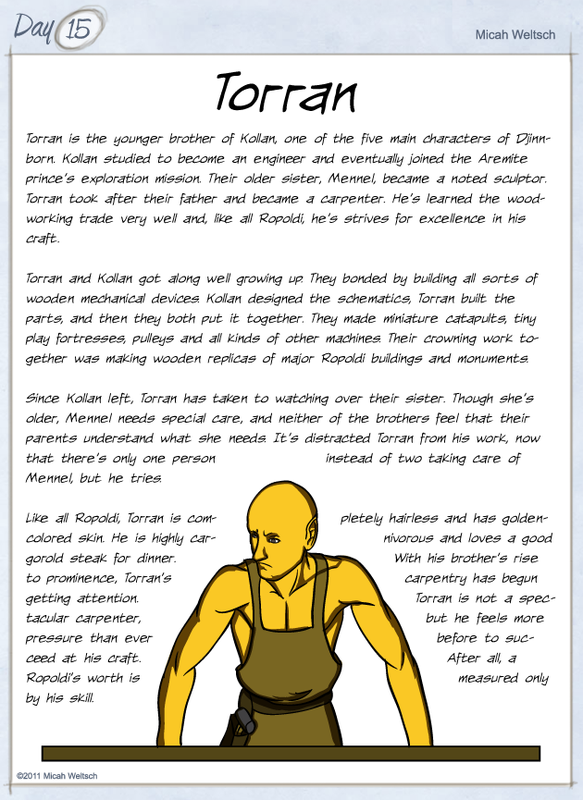 You can read about Kollan (Mennel’s brother and one of the five main characters) either on my blog post or at my deviantART. Not entirely sure if I like the colors. I kinda do, kinda don’t. I spent a lot of time tinkering with them and finally decided to be done. Remember this guy? Well, this is what the women of his race look like. Tall, purple, and willowy. I didn’t get her completely shaded so I’ll probably replace this image later this evening. She looks a lot better even with the partial shading than without, so I decided to put her up like this. I should note that in Musia, gender roles are very defined. Women handle most financial matters, men deal with most security and military matters. The two cogs function well as part of a larger whole, resulting in two Musian-led empires in recorded history. That’s why Musian men and women will typically dress and act very differently from each other. It’s almost like they live in two separate cultures. Musians also have three names, similar to Roman names. They typically go by their “middle” name, with the first being used for formal occasions and the last being how they identify family associations. I have plans for at least two more Musians (one male, one female), so stay tuned! 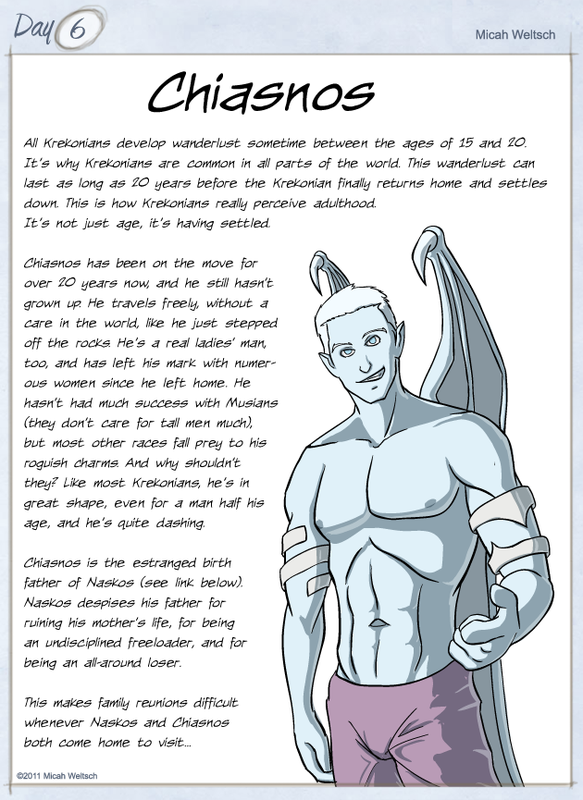 Special thanks to the Color Scheme Designer website for helping me develop a palette that goes well with sky-blue skin. Sketched, drawn, colored in Illustrator. You can read more about my setting on my comic development blog! Cyricus here is the fifth main character for my upcoming webcomic Djinnborn. He is a Musian, a race of militant men, mercantile women, and pronounced sexual dimorphism. The men are shorter, muscular, and built for combat, while the women are tall (the tallest of all the races) and shapely. Women have vibrant purple skin and bright golden hair, while the men have bronze skin and purple hair. My main cast of five has members of each race (or half-breeds) in each of its numbers. Cyricus represents the Musians as a sign of goodwill. 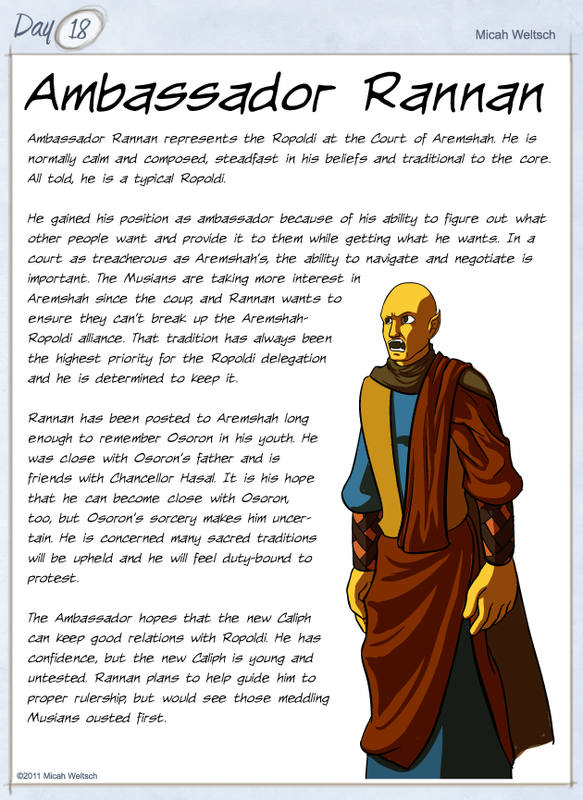 Musia has had a lot of tension with Aremshah (the nation where most of the action takes place) and Ropoldi (Aremshah’s ally), so Cyricus is traveling with the Aremite prince, Osoron (the main character) to foment goodwill between some Musian factions and Aremshah. 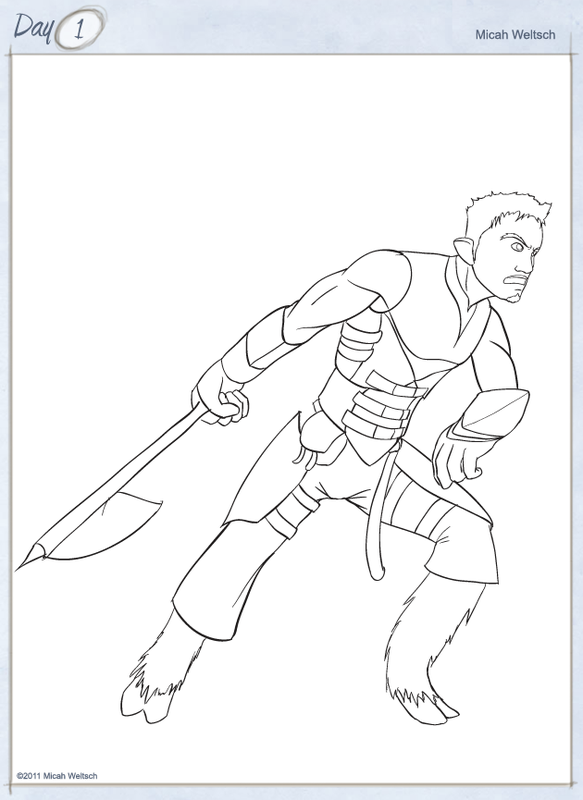 Cyricus, like most Musian men, is very martial, very well-trained in a number of weapons and combat styles. He’s also a light cavalryman. However, instead of riding horses, Musians ride great winged beasts into fantastic aerial battles. Since Cyricus travels on a skyship with Osoron, he and his steed (to be drawn as a later character) will get quite a bit of flying practice. If you want to learn more about the world this game is set in, take a look at my blog or stay tuned as I use the different characters of this challenge to flesh out the world some more. 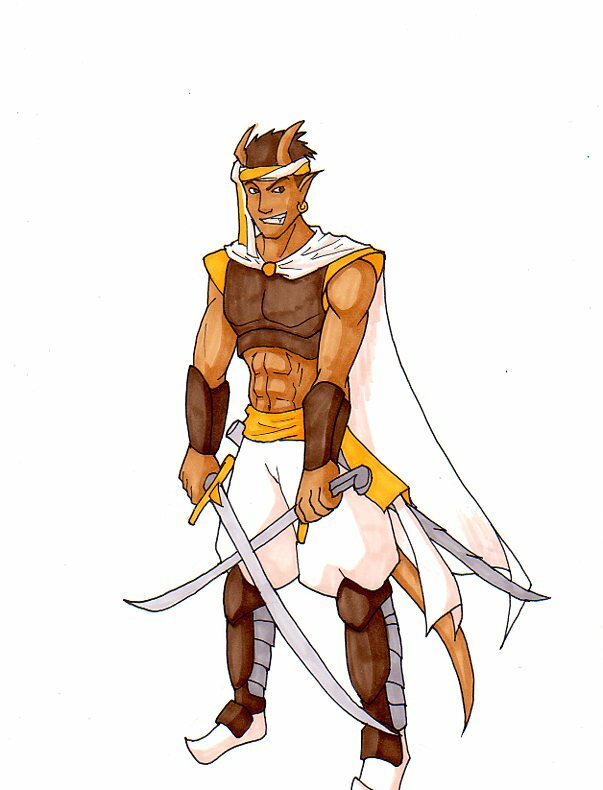 Didn’t get this one finished, but this is Verak, a half-dragon Arab-inspired swordsman. Character was designed by a friend of mine and I drew him based on that concept. Not gonna say too much due to time constraints. These two are Icicle and Glacier, Lilac’s musical accompaniment, confidants, and sometime bodyguards. Here are Blackscale and Priority Factor! In the superhero world I’ve been idly building (see Skyhawk and Patrick Sanders for more), these two are some of the main villains. Priority Factor is a rarity. She’s a telepath. 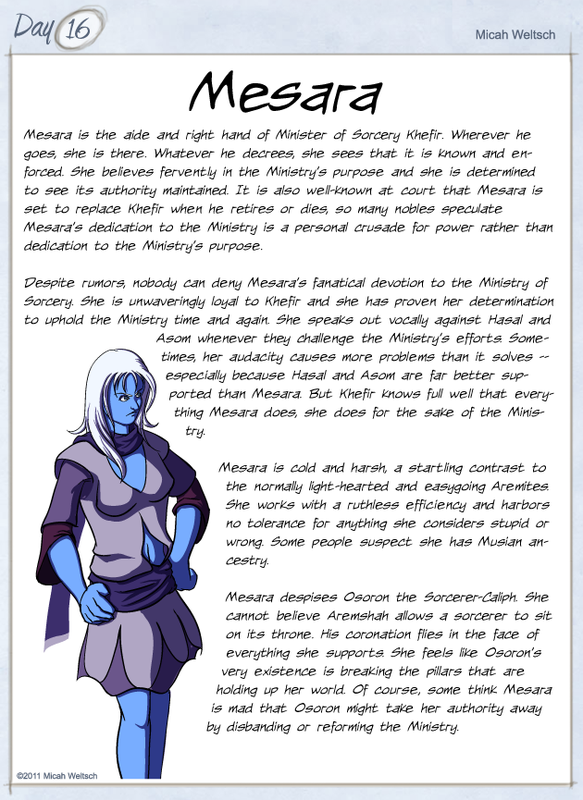 Her powers revolve around mental manipulation and she is determined to establish herself as the pre-eminent mind in the setting. When her powers awoke, her brain became that much more powerful, but it also kinda broke (telepaths in this world run constant risks of insanity, and Priority just didn’t make her Will save or something). Now a crazed madwoman, she runs around dominating minds that don’t submit to her. She’s become a quintessential mad tyrant in her own little world. Blackscale is her top lackey. He’s a stealthy reptilian fellow of indeterminate origins (read: Micah hasn’t figured out his background yet) who serves Priority loyally, possibly of his own free will. He’s her top spy and killer. The glowing green stripes on his body are capable of disrupting electronic sensors like radar and night-vision goggles, while the black scales help him blend in. He has a subtle chameleon ability, but it’s rather minor. He also has wolverine-ish claws, as you can see. 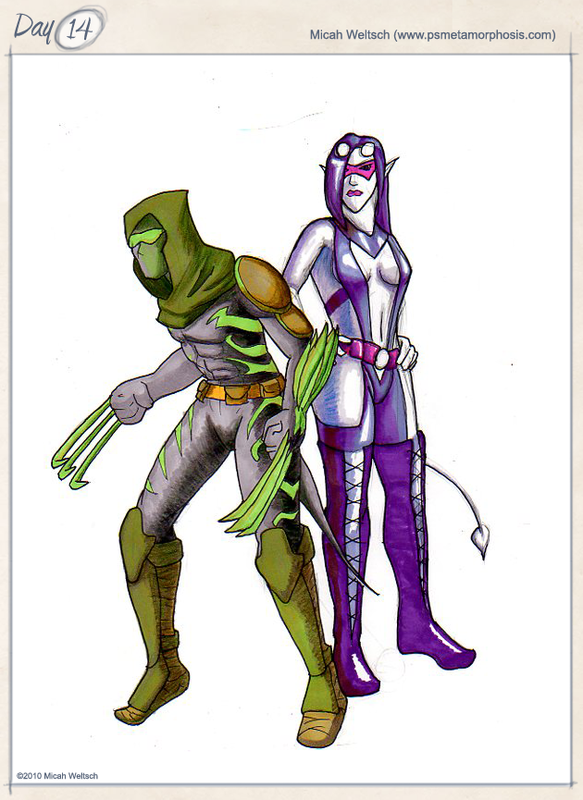 More about them if I ever decide to work on a superhero comic instead of a Planescape one! Meabh is an erinyes who will probably have a part later on in Metamorphosis. A devilish woman, she prefers many of the finer things in life. She is more a manipulator than a fighter and as an agent of Mephistopheles who trained in Grenpoli, she is very good at it. She is beautiful but terrifying and can assume a number of forms to suit her needs. She’s been a thorn in the sides of several Inner Planar leaders, and she enjoys every minute of it. This is not my character. 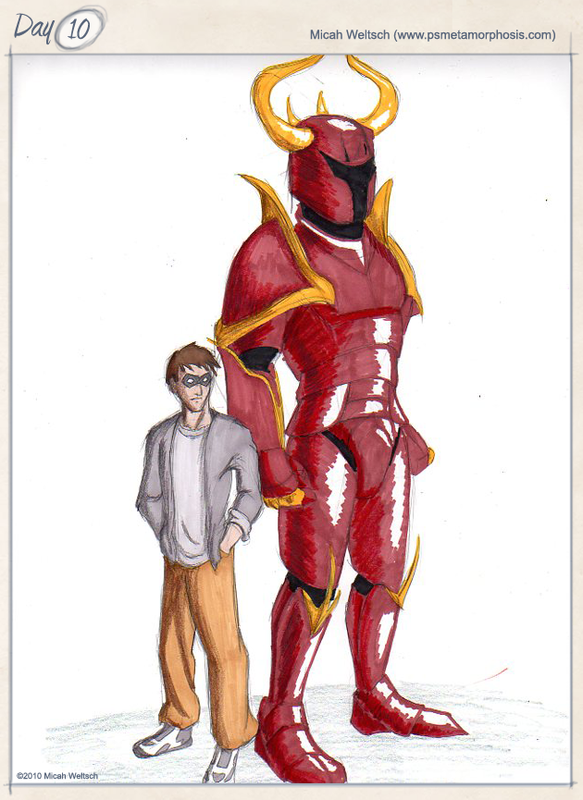 This design and character were created by the esteemed Vito Delstante who is running his own 30 characters gamut! When I saw this character, I thought the general design was cool and said I wanted to draw him! Vito said go ahead, and so I did! I made a few minor changes to the original design; nothing big. I think the biggest change is the belt piece, which I decided to link to the shoulderpads. 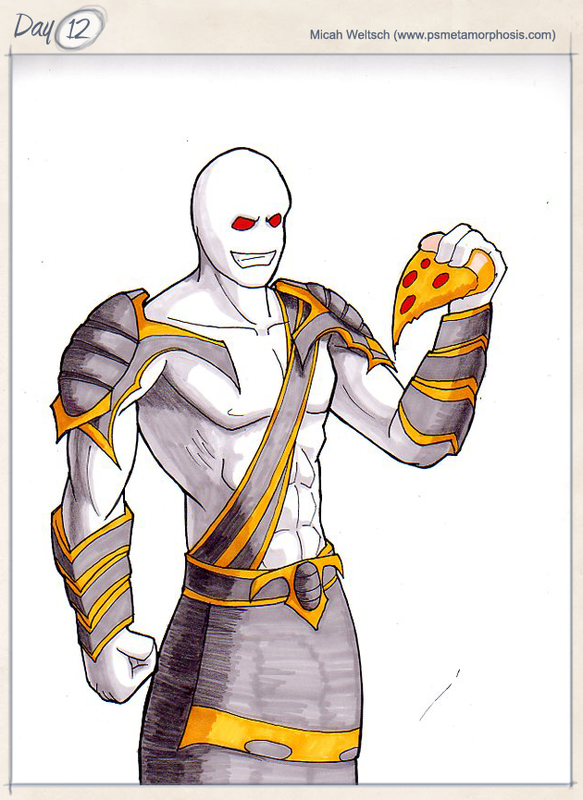 Xenos is eating a pizza. Vito’s design said he fell in love with Earth food and everyone likes pizza! 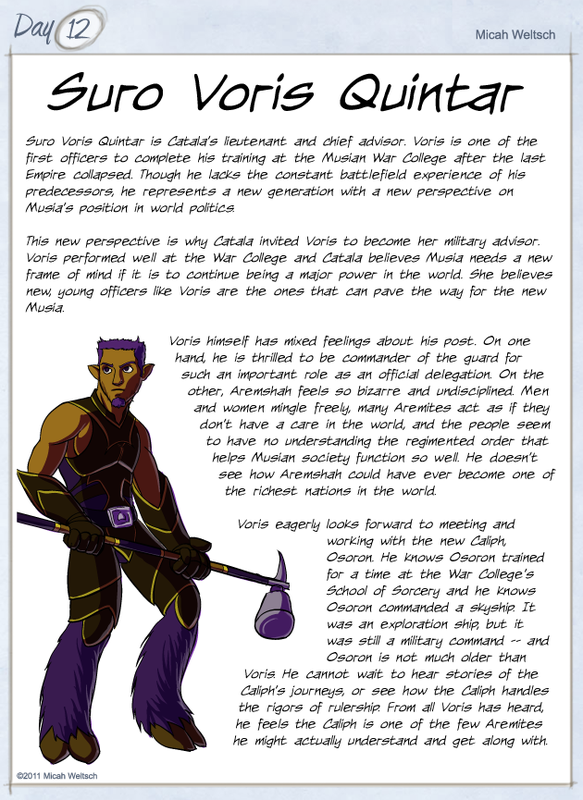 You can read more about Xenos on Vito’s original post. Another one of Ssilir’s gods. 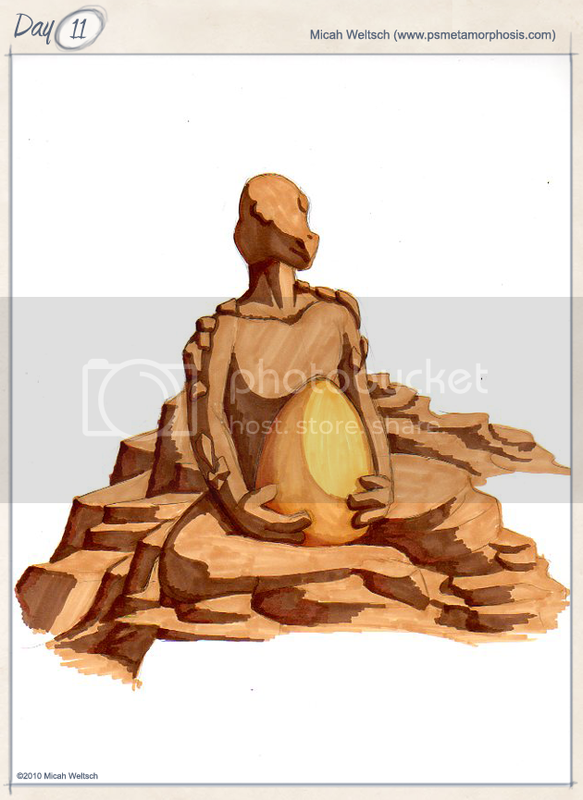 Medh is the daughter of the earth, a goddess of stone and soil. Along with her sister Deph, she influences the animal and plant world, but Medh presides over domesticated animals and agriculture. She is a goddess of architecture, cities, and construction, and is sometimes associated with money and trade. Finally, she is the goddess of the nest. 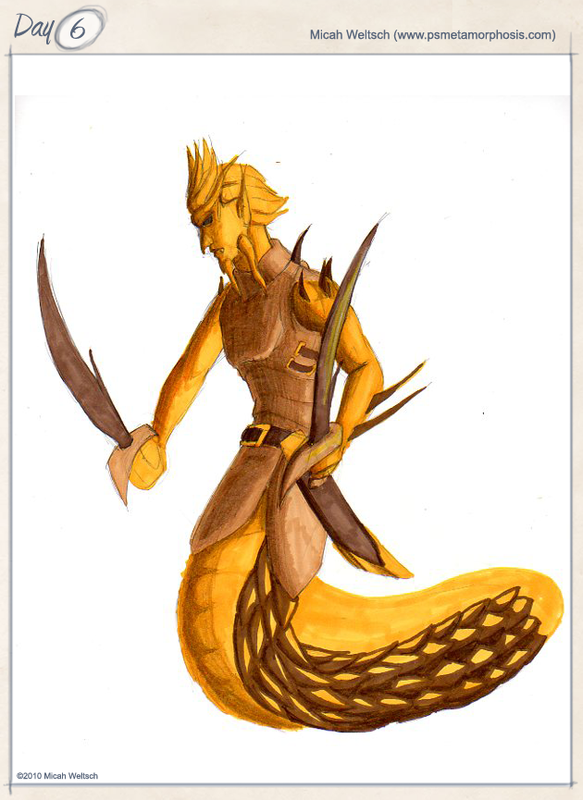 Ssilirians can procreate on land or in water, but they always nest on land. She is the goddess of female fertility and the guardian of the home. 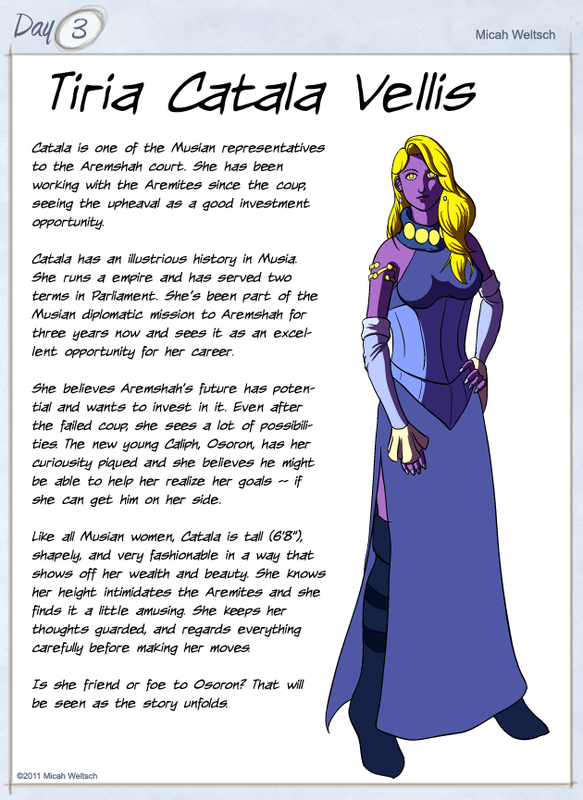 I’ll have a more detailed write-up of her when I feature her in my webcomic. Patrick Sanders is dead. At least, that’s what all the papers say. When the orphanage he lived in went up in flames, those responsible wanted to hide evidence of the drug tests they were performing, and all the children were assumed dead. Patrick escaped with a few others, but records indicate he died years ago. That’s all right, though, because Patrick is lucky. At first it just seems like he has an optimistic outlook on life. He says he’s lucky to be alive, he’s lucky to have his health, he’s lucky to have found a job that pays well enough to survive and won’t ask questions, he’s lucky the government hasn’t found him. But the truth is, Patrick is lucky. His power is mostly subconscious and works in small ways, affecting both himself and those around him. While his luck will never win millions in the lottery, it might get him enough off a scratch card to get him through a bad week. In a fight or a fall, it makes the difference between a broken arm and a broken neck. Now that Patrick has become aware of what he can do, it’s given him a remarkably positive outlook on life. He’s poor, has to live under the radar, and sometimes it seems like doesn’t have enough to get by — but it could always be worse. He knows how to make the most of what he has. That’s not all. Thanks to experimental drugs given to the children at the orphanage, Patrick’s mind awoke further, transforming him into a full-blown telepath. Few telepaths exist in the world and those that are known are rarely trusted. Patrick’s kept his abilities a secret from most people. All telepaths can read minds, communicate, and shield their minds, but each one has a quirk that is, as far as anyone knows, unique to that telepath. Patrick’s telepathy grants him supreme control over his emotions. Now, that doesn’t mean he’s got no personality. Patrick is still a pretty normal guy in terms of feelings. What it means is he can cause his emotions to manifest physically. Anger, hate, fear, love, joy, all these and more, Patrick can conjure an avatar of those emotions to fight for him. He is seen here with his Avatar of Fury. He has mastery of several emotions, but it’s unknown how many avatars are lurking in his mind. The possibilities could be endless — after all, nobody knows if the extent of human emotion can be concretely measured. There is one drawback. If Patrick experiences extreme emotion, an avatar can manifest spontaneously and it often takes on a mind of its own. Patrick’s telepathy shuts down when this happens until he can regain control of the wayward emotion. Fortunately, since these avatars are physical manifestations of Patrick’s psyche, they cannot deliberately harm him. He’s the leader of my little superhero group. 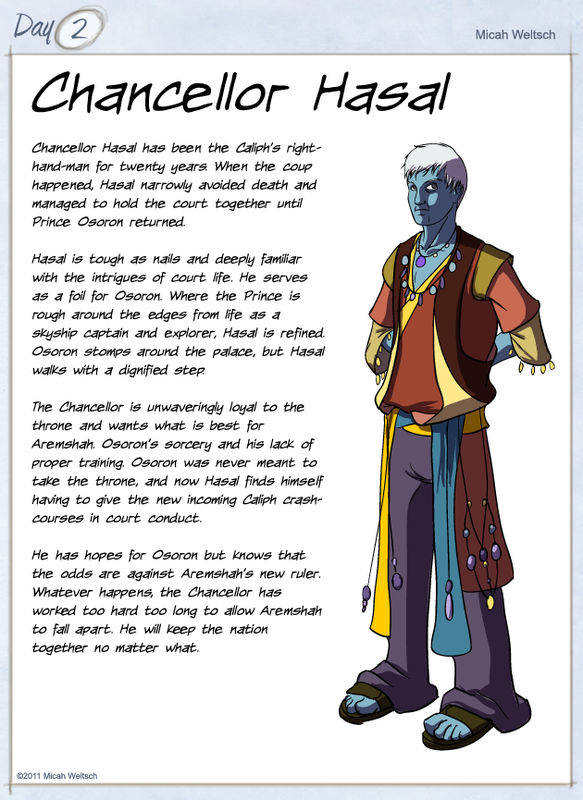 Though he’s not wealthy or powerful, he is a natural leader, thanks in part to his luck-manipulation and his telepathy. Also a small note: Patrick suffers from severe pyrophobia. The orphanage where he lived burned down and Patrick was trapped inside. To this day, he is terrified of anything larger than a campfire. Even smaller flames make him nervous. Interestingly, his Avatar of Fear manifests as a creature of fire. I’m not 100% satisfied with the Avatar, and I think Patrick looks younger than he is meant to. I envisioned him as a lanky, kind of nondescript fellow. He doesn’t wear a super-costume, but his avatars do most of the fighting for him anyway. I always envisioned his Avatar of Fury as this giant, armored tank being, but this is the first time I tried to actually design him. If I work with him again, I will probably do some more design options to come up with a more “furious” design. 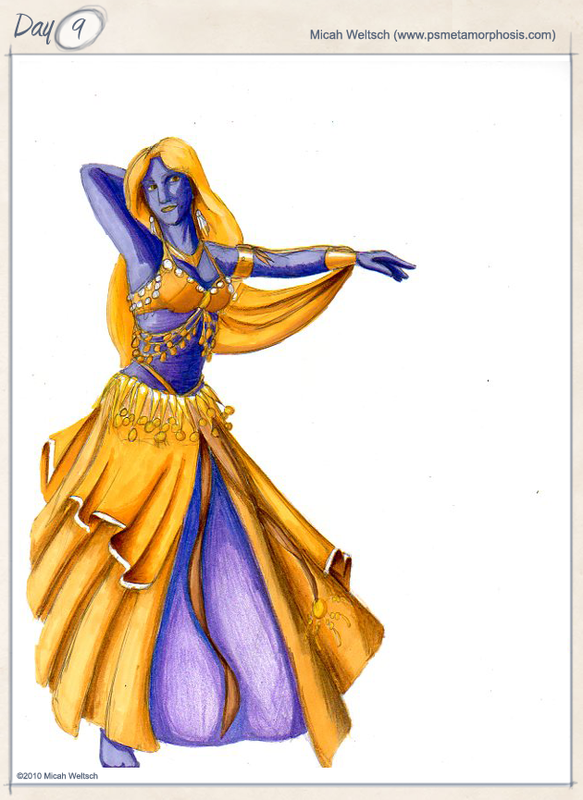 Presenting Lilac, the lovely dancer and favorite performer at the Glowing Gem Festhall in Aremshah, the Plane of Air. 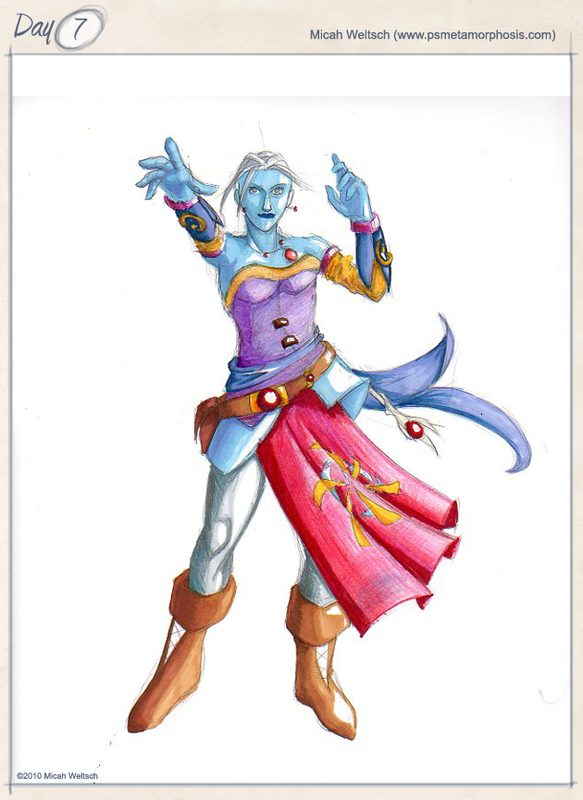 Lilac is a genasi of radiance, a person touched by the raw power of light and color at birth. She glows with a vibrant aura and she seems to weave light around her in fascinating patterns while she dances. She is the most beautiful woman at the Glowing Gem, but she keeps the quiet company of her two closest friends, Icicle and Glacier, ice genasi twins. Lilac shares a bond with the twins, but nobody knows why they are so close. The twins act as her musicians, but also as her confidants and protectors. They’ll be showing up in a later 30 Characters drawing from me. Again with the pencils and markers. I got a few new marker colors this weekend and got to try them out on this picture. I’m probably going to get some black ink pens though. Some parts of my pictures would be better rendered with a bit of bold black lining. I can see a couple places on this one where a few choice lines might help it pop, but overall I’m very pleased with how she turned out. Rory “Skyhawk” Campbell is an adrenaline junkie. He rafts, base-jumps, climbs, hikes, and parkours. Nature is his playground and his gymnasium. Who says you need to play organized sports or work out in a gym to get your exercise rush? One day, Rory was climbing a tall cliff without gear. He loved tempting death. The more dangerous his sport, the more satisfying the rush. Suddenly, he slipped and fell. For a moment, he reveled in the fall, the rush of wind around him and the freedom of the open air. Then terror crept in as he realized he was about to die. Rory gritted his teeth and prepared for the inevitable. Suddenly he realized he wasn’t falling down. He was falling up. The rushing wind lifted and tossed him on top of the cliff. He tumbled and picked himself up. Bruises and scrapes covered his body, but he was alive. Rory stood in stunned silence for a minute. Then he grinned. Talk about an adrenaline rush — there was no better way for a guy like him to discover he was a superhero. Rory has the power to control the air and in the years since his power first appeared, he’s been pushing himself. He experiments to test his limits, see what he can do, and try to push himself beyond those limits. If something’s worth doing, it’s worth doing thoroughly, and learning about his abilities is no exception. Rory can manipulate air currents within a mile of himself and can move several tons with concentrated blasts of wind. His powers have come with thrilling side effects, too. He no longer has to breathe because his lungs continually manufacture fresh air. He can also survive in high- and low-pressure environments and extreme hot and cold weather has no effect on him. 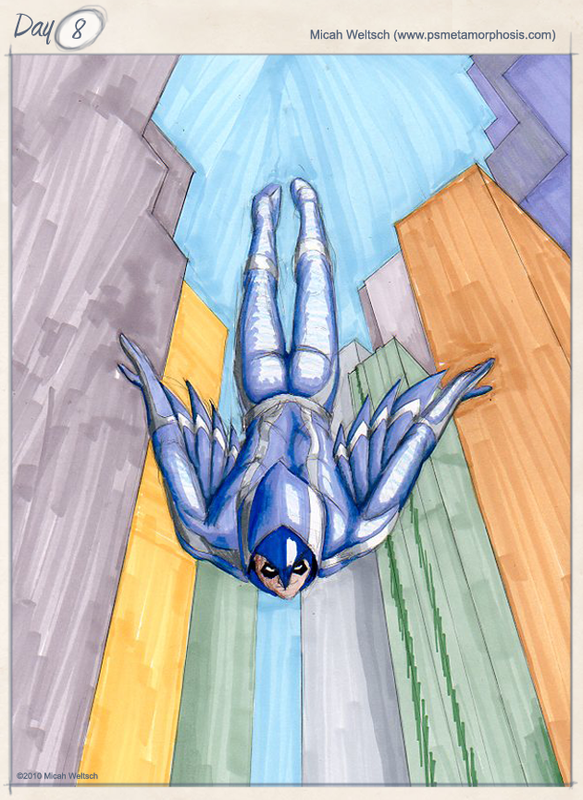 He’s able to fly at high speeds and his mind has started working faster at simple tasks than most human minds are capable of. Rory still pushes himself to see how far his powers go. With his mastery over the air, it’s possible his powers can develop into full-fledged weather control. After all, it’s the air currents that help bring in storms. I will probably redo this one digitally some time down the road. I think it’ll look better that way. 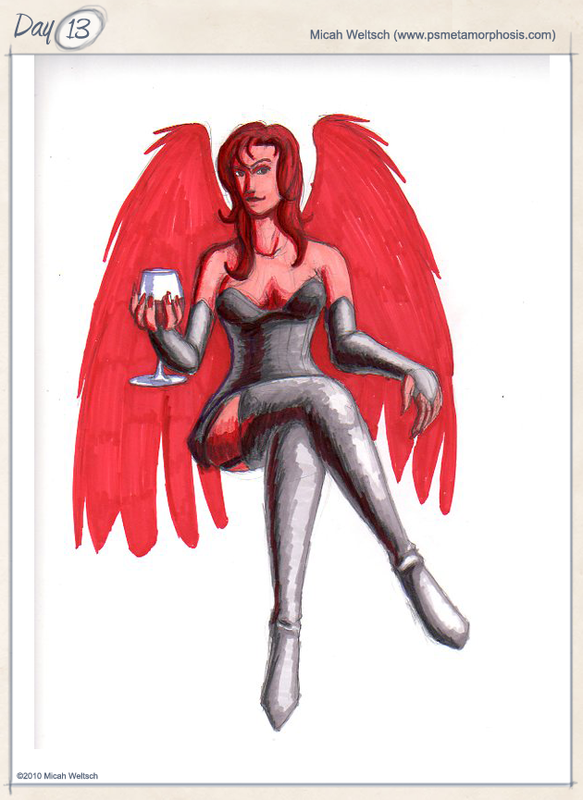 This is K’zink’s mother from my comic, Metamorphosis. I don’t have a name for her yet. She’s a powerful sorceress that K’zink’s been looking for for a while now. K’zink arrived home one day to find the house had been burned down and no sign of his mother. She was once skilled enough to woo a genie and become his consort. K’zink suspects she’s still alive but doesn’t know how well her powers protected her from the blast. She will be important in the future of Metamorphosis, so if you are following the comic, keep an eye out! 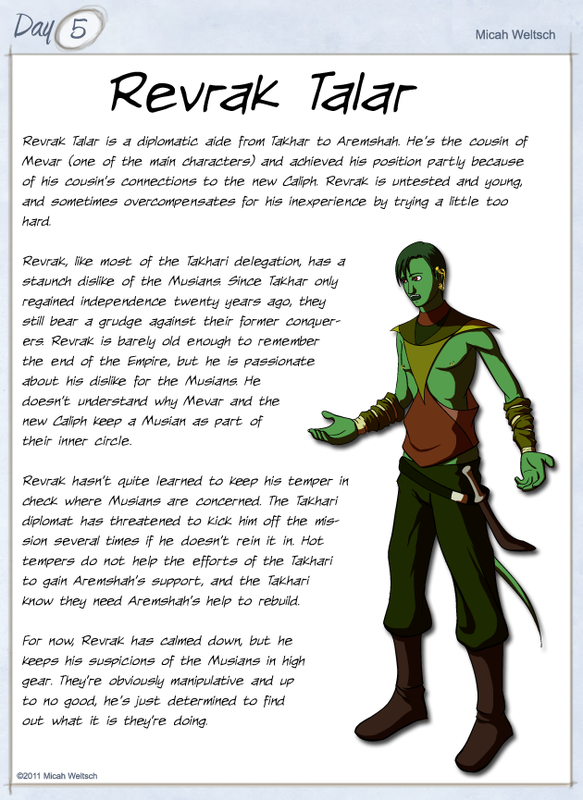 Galtai is a salamander warlord and Hashim’s master. 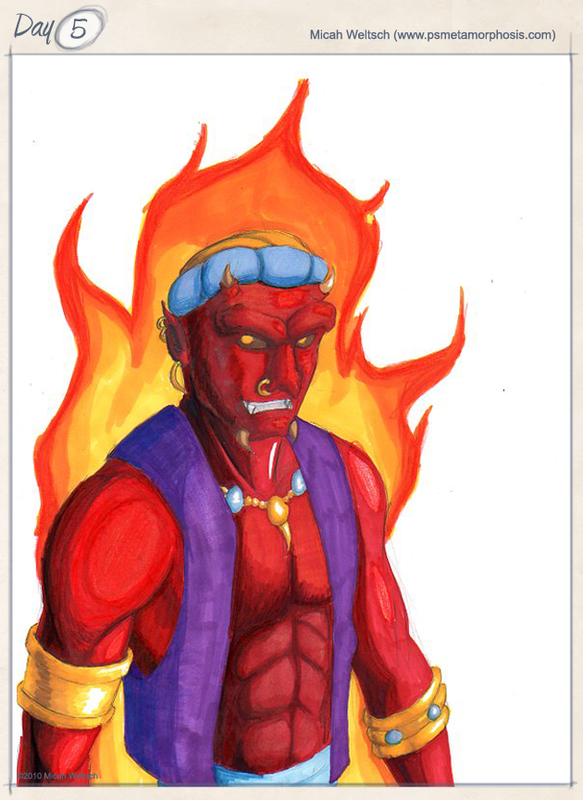 He’s a native of the Plane of Fire and has a long-standing rivalry with many marids. 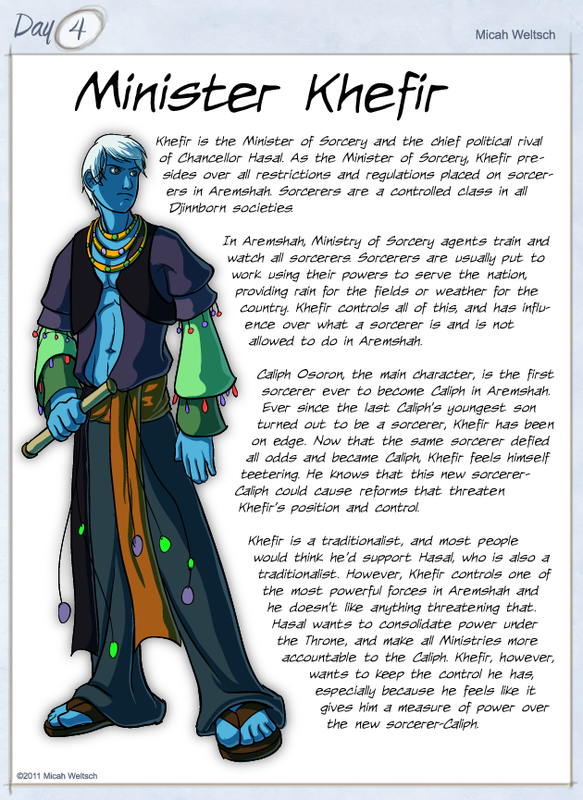 Galtai will present a constant threat toward later parts of Metamorphosis as he and Hashim cause problems for one of the main characters of Metamorphosis. I was inspired by those pointy samurai helmets. I wanted him to look like he was wearing one of those fearsome warrior helmets with spines and horns sticking out everywhere. Incidentally, Galtai is a Mongol name meaning Fire or something. Very inspired, I know 😛 It was a working name for a while but it really grew on me. It does have a certain “oomph” to it that fits a warlord. This is Hashim, an ifrit that has appeared once in Metamorphosis. He’ll be appearing several times in the future, too. I had a design of him already but I wanted to try my hand at a new design from ground up. There are parts of each design that I like. The older design had a lot more jewels and gold, and I think that’s something this design is missing. In any case, he’s a nasty who’ll be a thorn in the side of one of my characters. He’s conniving, evil, and he prefers to manipulate than resort to brute force. He’s the sort that thinks life is better when you have slaves to do your bidding for you. This picture is mostly markers. Also I know this is only #5, but 6 and 7 are coming soon and 8 should be done soon. I will get caught up one day. Just gotta get there!